Raleigh, N.C. (February 12, 2019) – Nufarm welcomed 11 newly selected assistant superintendents to the EXCEL Leadership Program at the Golf Industry Show. The new class members convened in San Diego along with the returning EXCEL class to kickstart a year of expert-led and peer-explored leadership development. 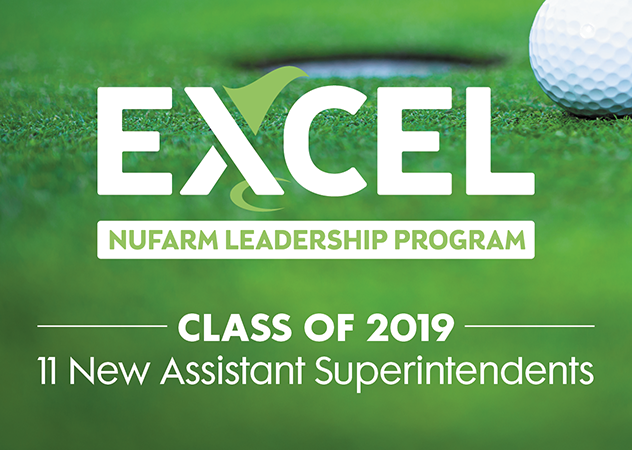 The EXCEL Leadership Program, a Nufarm and GCSAA collaboration, offers leading-edge development opportunities for assistant superintendents chosen from many excellent applicants. Each class participates for three years, meeting three times during each year, to receive in-depth professional development that focuses on one fundamental growth area each year. Personal development in 2018. Leadership development in 2019. Community stewardship in 2020. Following which the curriculum repeats until all class members have been immersed for a year in each topic. The new and returning EXCEL class members met at breakfast at the start of the Golf Industry Show (GIS). The first class shared what they gained from the program’s first year; the second class shared what they hoped to gain. The expectations grew from last year to now as it has been widely reported that several first-year EXCEL members have experienced advantages from the program. The groups teed-off their aspirations at GIS development sessions held February 4 through February 7, covering topics such as mindfulness and millennials, recruitment and retention, networking strategies and issues advocacy. They’ll convene midyear for their second gathering of 2019 at GCSAA. Brandon Anderson of Edgewood Country Club in Pittsburgh, Pa.
Hunter Brewer of FarmLinks Golf Club in Sylacauga, Ala.
Nicholas Carothers of Aronimink in Newtown Square, Pa.
Chad Gilkison of Wolf Creek Golf Links in Overland Park, Kan.
Anthony Minniti of The Creek in Locust Valley, N.Y.
Brett Oxley of Country Club of Decatur in Warrensburg, Ill.
Daniel Palin of Vinoy Resort and Golf Club in Saint Petersburg, Fla.
Conrad Pannkuk of The Club at Wynstone in Lake In The Hills, Ill.
Marty Savage of Green Valley Ranch Golf Club in Denver, Colo.
Mike Teatum of North Hempstead Country Club in Port Washington, N.Y.